Staff photo by Steve Muscatello New Ulm No. 1 singles player Colton Collum hits the ball during the Eagles’ match against Redwood Valley Monday at New Ulm High School. NEW ULM — Battling a tough wind in the home opener, New Ulm’s Isaac Blumhoefer just wanted to play it safe on Monday. Blumhoefer didn’t do anything fancy and instead kept the ball in play, forcing his opponent to make the mistakes. It enabled him to pick up a 6-1, 6-0 victory over Ben Collins at No. 2 singles on Monday. 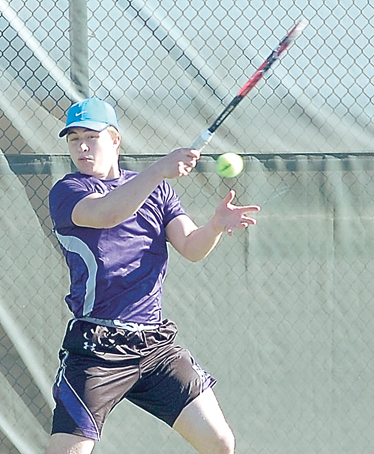 Overall, it was a good day for New Ulm as it defeated Redwood Valley 5-2 in Big South Conference boys’ tennis action at New Ulm High School. At first singles, Colton Collum lost to Swedish exchange student Rikard Wilkens 6-2, 6-0. New Ulm’s Max Gieseke picked up a quick 6-0, 6-3 victory at No. 3 singles and Redwood Valley’s Jacob Zollner defeated New Ulm’s Justin Schapekahm 1-6, 6-2, 11-9 at No. 4 singles. At first doubles, ­the New Ulm duo of Aaron Eikanger and Jack Brownfield picked up a 6-2, 7-5 victory. Ethan O’Connor and Dan Rosenhamer won 6-4, 6-3 at No. 2 doubles over Josiah Hultquist and Logan Frank, and Cody Gilman and Peter Spengler won 6-1, 6-0 at No. 3 doubles. New Ulm resumes action on Tuesday when it hosts Hutchinson in a nonconference battle.